Polish Ice Dancers Alexandra Kauc and Michal Zych Look Forward to 2006 Olympics. Alexandra Kauc thought she had a good chance of making it to the Olympics in 2002, especially after finishing 17th at Worlds in 2000 with former partner Filip Bernadowski. But the couple finished skating after the European Championships in 2001 and Kauc concentrated on her studies. Now she’s back in the sport after a two-year absence and hoping for better success with a new partner, 22-year-old Michal Zych. The couple started training together in April 2003. “Michal called me last year after Europeans,” Kauc said. “The Polish Federation gave him a proposal to call me. I had been focusing on my school for the last two years since my last partner stopped.” Kauc had previously competed with Michael Przyk and Krysztof Tomaczyk before her success with Bernadowski. But they have had bad luck so far this season. Standing in second place after the original dance at the Nebelhorn Trophy in September, the couple had to withdraw after Kauc fell ill with food poisoning. Then at Skate America in October, the couple were in sixth after the compulsory dance. But they fell to tenth overall after a bad fall in the original dance when Zych’s blade hit a sequin on the ice. “Our dance was well skated,” Zych said. “We would have been much higher except for the fall.” They will next compete at the Cup of Russia. “Our goal is to be in the 2006 Olympics,” Zych added. “That is the goal of all sportsmen. Our dream is to be in Torino.” It’s a dream they have been pursuing for a long time. Both skaters began the sport when they were five. Kauc first went skating because her best friend’s mother took both girls to the rink to play. She took to the sport immediately and competed for a few years in singles, but didn’t really enjoy it. “I didn’t like to jump and fall,” she said. “I preferred to show some skating.” When she was eleven, her coach asked her to try ice dancing, and she’s been a dancer since then. “I started just for recreation, then later I started competing,” Zych said. “Everyone in my family does sports. My parents are very sportive. 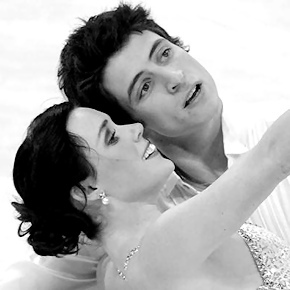 They are competitive kayakers.” He was a singles skater for seven years, but switched to ice dancing when he was 15. “I had problems with my spine and my doctor told me I would have to take a three year break from skating if I wanted to do jumps,” he explained. He reached second in Polish juniors with Agnieszka Szot, then looked for a partner for two years, skating in Belgium and the U.S. and working with Natalia Dubova for a short time in Connecticut. Maria Olszewska-Lelonkiewicz coaches the dancers in Lodz, Poland. They train for two hours twice a day five days a week plus another hour and a half on Saturdays. In addition, they have two hours of off ice training including running, conditioning, ballet, classical, modern, and jazz dance classes. They also trained at the Detroit Skating Club for several weeks in the summer to work on their choreography and sometimes train in Moscow, Russia and Krynica, Poland. Both skaters enjoy going out with friends and watching movies. “It’s a good means of relaxing when you’re in the cinema,” Kauc said. Zych also enjoys sitting in front of the computer and surfing the Internet. “I’m interested in all kinds of electronics and computers,” he said. For other sports, he likes to ride his bike and she skis. Kauc also loves all kinds of dancing. “I could not live without dancing,” she laughed. She also enjoys reading biographies and detective stories or just resting at home, listening to music. He also likes to take photos of historic buildings and nature. Neither of the skaters has any collections. Kauc said she keeps some of the stuffed toys that she receives, while she gives others to her sister’s children or to her dog, Mimi, to play with. In addition to skating, Kauc is in her fifth year of university studies in physical education, with less than a year until completion. Zych has graduated from high school and is planning to study either physical education or psychology at the university. He is considering getting a master’s degree in sports psychology, a field with few practitioners in Poland. One of his goals is to speak English as well as his partner.